There is no state in the union more synonymous with football than Texas. From the Dallas Cowboys to the unbeaten Texas Christian University Horned Frogs and Texas Longhorns, to Friday Night Lights, pigskin has long defined the Lone Star State. Yet one group is determined that in a time of serious economic crisis, football know its place: the faculty at the University of Texas, Austin. In the face of withering media criticism, they deserve our support. 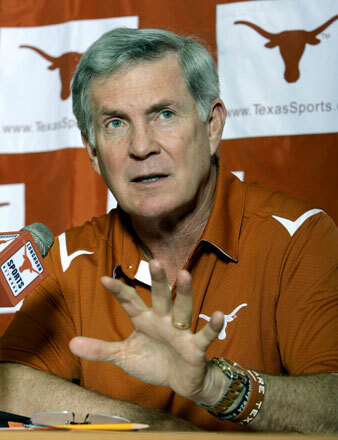 Following an undefeated season and a trip to this week’s Bowl Championship Series national championship game, the University of Texas System Board of Regents upped coach Mack Brown’s total compensation from $3 million to $5 million a year. In response, the Faculty Council voted to condemn the raise as “unseemly and inappropriate.” Why would it critique a raise for the man who has led UT football to national glory and millions of dollars in television, alumni and bowl revenue? Here’s why. At a time when Texas football is doing remarkably well, the rest of the campus is tightening its belt. The UT Tuition Policy Advisory Committee has recommended that undergraduate tuition increase 4 percent a year for the next two years–true, it’s nowhere near as bad as 32 percent at the University of California, but in a recession that’s small comfort. Departments across the campus are feeling the pinch and being asked to make significant budget cuts–$5 million in liberal arts next year alone. Layoffs and hiring freezes have been announced in several departments. At every turn, academic priorities find themselves, for lack of a better term, sidelined. Predictably, the sports media have been out front and center defending these priorities. Former Washington Redskin All-Pro Lavar Arrington addressed the faculty on his radio show, saying, “Hundreds of thousands of people don’t show up to watch you teach.” Edwin Bear on Bleacher Report wrote in an article subtly titled “Texas Head Coach Mack Brown Deserves His Two Million Dollar Raise,” “The Texas football program brought in a nationwide record $87 million in 2008. To add Texas’ football program channeled $6.6 million into UT’s academic programs in recent years, according to UT’s president William Powers Jr. in an ESPN article. (By the way how awesome is the last name Powers esp when he’s the president where he works?! )” Yes. It’s so awesome, it almost makes up for the fact that the school is raising tuition and cutting salaries to the bone. It also mistakenly gives the impression that surpluses are a fact of life at top football programs. Hardly. In October the Knight Commission on Intercollegiate Athletics report from college presidents at institutions with major football programs found that twenty-five of the top football schools had revenues on average of $3.9 million in 2008. The other ninety-four ran deficits averaging $9.9 million. “We’ve reached an indefensible, unsustainable situation,” said commission co-chair William Kirwan. “We’ve got 75 percent of the presidents saying we cannot continue on this path.” No doubt, Texas is one of the haves. But the school is now playing roulette with its future, gambling that this will remain the case. This train has long been out of the station. A century ago, the great intellectual (and sports fan) W.E.B. Du Bois wrote about the corrosive effect college athletics was beginning to have on the health and culture of academic institutions. If schools are reduced to football factories where they happen to teach classes, everyone loses: particularly unpaid players who generate millions and are told they are being paid with academics. Without the academics, they nakedly become chattel, delivering a new contract for their coach and a whole lot of school spirit without even the pretense of a functioning college in return. These are tough times, and it’s in tough times that we turn to our sports teams for a sense of pride, hope and accomplishment. But this is really a question about the future of higher education. For a generation, universities have been increasingly organized to deliver a profit, and the idea that these are places that should value learning for learning’s sake has become quaint. The gears of the machine are moving ever faster in the wrong direction. It is high time we lie upon them, or we’ll face a future with football on Saturday followed by six days of manufactured ignorance. Snehal ShingaviSnehal Shingavi is an Assistant Professor in the Department of English at the University of Texas/Austin.